This little guy’s family was soooo ready to meet him – especially by the end of a labor that spanned almost two full days and nights! But both Rowan and his mom, Colleen, hung in there until the very end. In an effort to write less and let the pictures tell the story, I’m not going to go on and on. 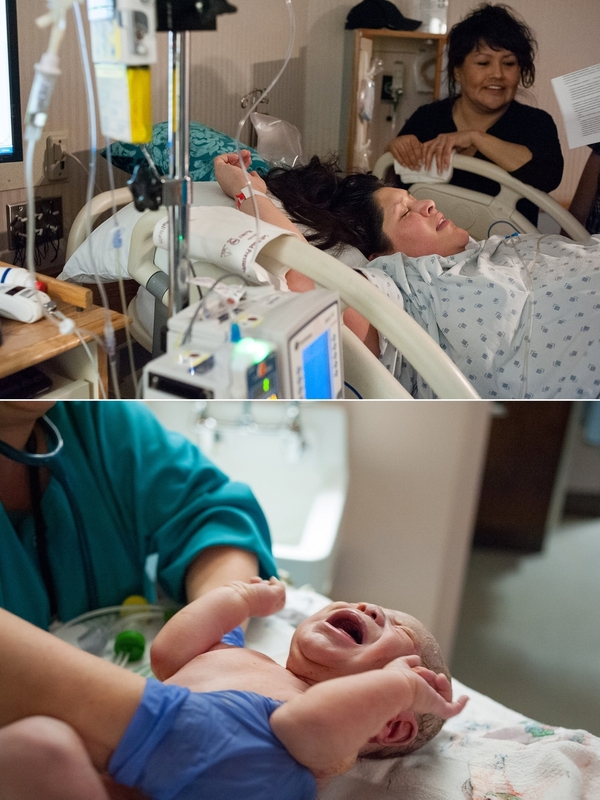 But I do have to say that one of my favorite things about this birth was the intensively supportive environment both Joe and Colleen’s aunt created in that little hospital room. It was chance that Colleen’s aunt was visiting from Fort Yukon when Colleen went into labor – and amazing kismet. Colleen later joked that she has kind of served as the family’s doula, as she had attended her own daughters’ births and also Colleen’s sister’s birth, and now she was here for Colleen as well. And even though she isn’t (technically speaking) an actual doula, this is one of the births that springs to my mind when I think about doula-assisted births and the incredible connection women can forge during labor. Colleen and her aunt went into the zone together: they maintained a deep connection through Colleen’s intense back labor as her aunt coached, encouraged, and supported her, always with Joe by her side.